An emergency VHF radio call on the opening day of Weston RNLI Lifeboat Week shows what the money raised is used for. 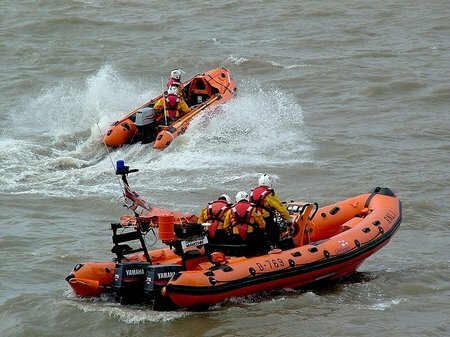 Saturday was the first day of Weston-super-Mare Lifeboat week. An eight day celebration of our lifeboats and their crews combined with a flurry of fund raising activities. Just as the fundraisers and crew where relaxing after a hectic day a PAN PAN Call was received by Swansea coastguard who immediately paged the volunteer crew. The High Street of Weston and its Italian Gardens were full of holiday makers, townsfolk doing their shopping and dedicated fundraisers and crew from the RNLI station. There were competitions, quizzes, and a karaoke, with hand painting for the children. Street dancing and fitness experts showed the tourists how to improve their health while a reflexologist helped them relax. The public could view a lifeboat and crew were there to explain what they do. This activity is vital for the RNLI, as a charity, to raise money to provide the equipment, lifeboats and crew kit needed to provide the 24 hour a day, 365 day a year service. At 1952 hrs all had been cleared away for the night and those who had been helping were settling down to a well earned rest. However the yacht Tranquillity, in the strong tides of the Bristol Channel, was in trouble. There was very little wind so it was unable to sail. While motoring towards its home port of the River Axe, just south of Weston, white smoke came out of its engine room and the engine stopped. The skipper was unable restart his engine and realised that he was being carried by the tide down the Bristol Channel and unable save himself or his vessel. He sent out a PAN PAN call, the second most serious emergency call for help. This was picked up by Swansea Coastguard who, after assessing the situation, requested the launch of the Weston-super-Mare lifeboats. The crew were paged and both boats were in the water and making best speed to the casualty within ten minutes of the call. The Atlantic 75 lifeboat Coventry & Warwickshire reached the yacht, one mile south of Flatholm Island, and put crewman Martin Fear on boat. He attached a tow rope and the casualty was towed to the River Axe. There it was placed alongside the Yacht Club Moorings until the engine could be repaired. The lifeboats returned to their base on Birnbeck Island and were made ready for their next service. The activities of Lifeboat Week will continue until the Open Day on Sunday 7th. Who knows how many calls will be received by the crew in that time?